Toys "R" Us mascot Geoffrey the Giraffe has packed up his suitcase -- presumably full of toys -- and left his toy kingdom for good. 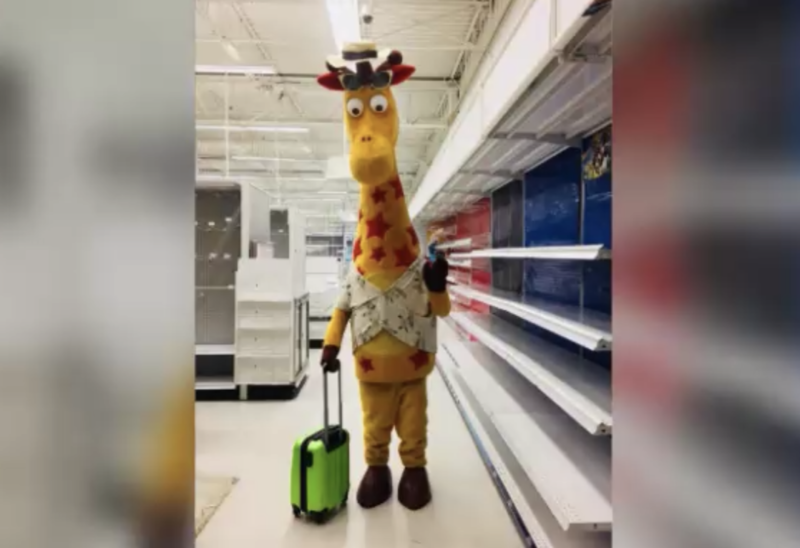 A heartbreaking photo of Geoffrey is circulating, one day before Toys "R" Us closes its remaining stores. The photo shows the giraffe in an empty Toys "R" Us, holding a suitcase and waving goodbye. The photo was taken by Rene Johnpiere, who appears to work at a Toys "R" Us. Johnpiere posted several other sad photos of the empty store on Facebook. She shared photos of empty shelves, vacant shopping carts and a group of employees locking the doors of the soon-to-be shuttered store. "My heart is breaking," Johnpiere wrote with a photo of the store's sale signs. She has also shared nostalgic Toys "R" Us commercials from the '80s and '90s to commemorate the end of the company. Her photo of Geoffrey the Giraffe leaving got the most attention, receiving nearly 300,000 shares on Facebook. The image captures the end of an era and sadness many people feel watching their favorite toy store close forever. Many kids grew up watching Geoffrey the Giraffe in TV commercials. The iconic jingle "I don't want to grow up, I'm a Toys "R" Us kid," was engrained in many people's minds. The store has made many countless peoples' faces light up over the past 70 years. The shelves may be picked clean, but this does not mark the end of the memories so many people have of Toys "R" Us.